Welcome to our new website. Please check this page for updates on CAYAC. All work will be returned to schools at the end of the exhibition. 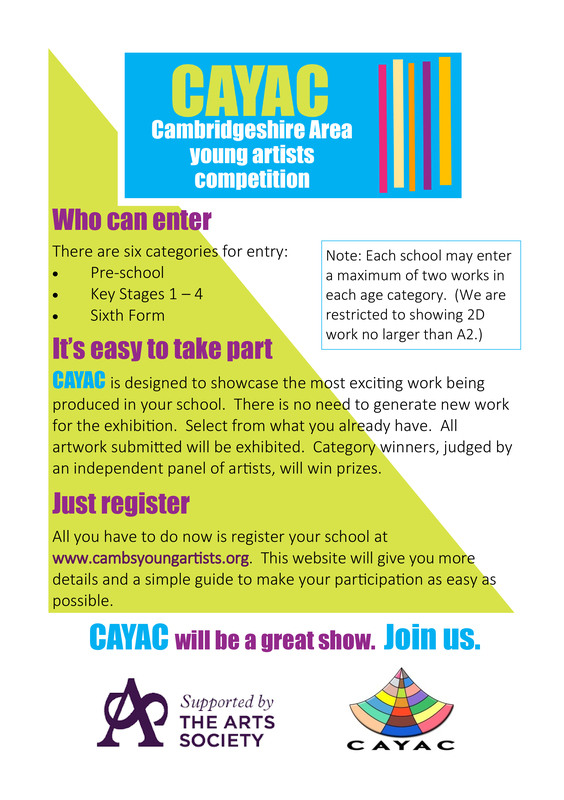 We are pleased to announce that we have judges for this year’s CAYAC exhibition from NNF Bridge (see https://nnfestival.org.uk/festival-bridge), from Kettle’s Yard (see http://www.kettlesyard.co.uk/) and from the Fitzwilliam Museum (see https://www.fitzmuseum.cam.ac.uk/). 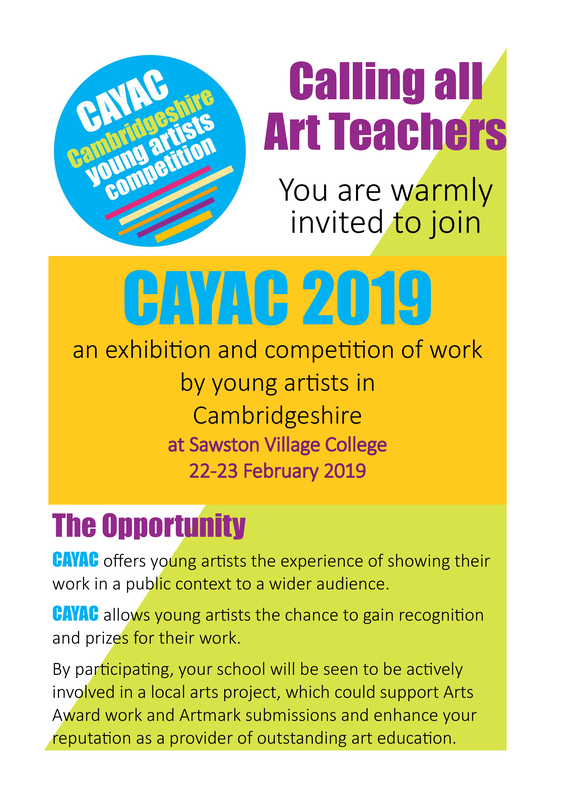 Thank you for choosing to take part in this year’s CAYAC exhibition at Sawston Village College. 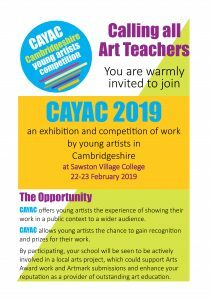 All work to be included in the exhibition should be delivered to Sawston Village College between 21-25 January. It should be dropped off at the main reception which is open between 8.30 am – 4.00 pm during the week. If you are unable to deliver your work within this time or need help with the delivery of your work, please contact Margaret Gledhill at mjgledhill@ntlworld.com who will be able to advise. 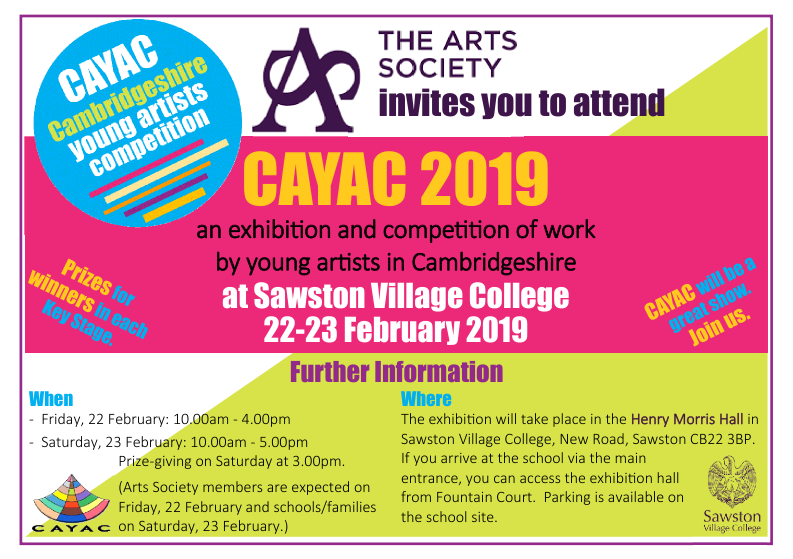 Arts Society volunteers may be able to help transport your work from your school to the exhibition venue at Sawston Village College. Look out for more information about this.